As we are well within the realm of the new Star Wars canon, I'm still catching up with the old Expanded Universe books, now known as Star Wars Legends. And now that there exists a finite number of Legends books and how I have copies of most of them, it now becomes an odd geeky goal to try and read all of them sooner or later. Alas, I still have a fair amount of catching up to do. 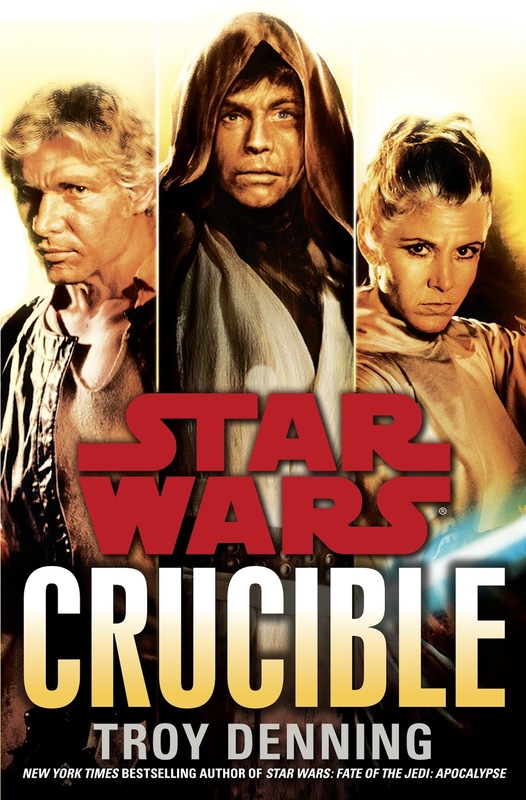 Thus we get to Star Wars: Crucible, one of the last Legends books to be released. It's an interesting little adventure that features all the usual players but in a setting that is already rich with Legends back story. That's a good and a bad thing given just how much has happened outside the movies in the old Expanded Universe. This book really felt like a nice wrapping-up book as is. The core story has all the usual beats we've all come to expect from a Star Wars book but then it sort of pivots towards the end to add a bit more value. It's not quite the be-all, end-all Star Wars book to wrap up your Legends adventure but it's a nice stopping point. 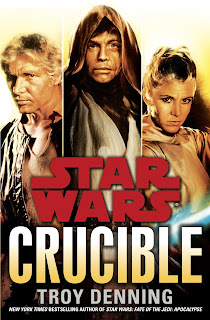 Synopsis: Star Wars: Crucible was written Troy Denning and was pretty much the last Star Wars Expanded Universe book before the Disney acquisition rebooted Star Wars canon. Disclosure: I had forgotten that I had received a free copy of this book through NetGalley in exchange for my honest opinion of the work, although this opinion is now very, very late. The story begins with Han and Leia Solo traveling to meet Lando Calrissian to help with some pirate trouble he claims to be experiencing with his latest mining operation, this time well off in the Outer Rim. But from the get-go things get interesting as the Solos encounter some of the forces giving Lando trouble. They're part of a larger group that is trying to pressure various smaller mining companies to sell out to them. And they're not very good at taking no for an answer. Meanwhile Grand Master Luke Skywalker receives a message from the Solos requesting for information and for someone to courier it to them as Lando's facility has limited communications access. With Luke feeling a little unsettled with things for some reason, he decides to handle his task himself as it has also been a while since he hasn't spoken to his son, Ben, who was last reported in the same area conducting an investigation of his own. What I Liked: This book was focused more on our big three heroes - Luke, Leia and Han, which is a nice shift as we've been a bit more focused on the new generation of Jedi ever since the New Jedi Order books. And they're such a solid team for a reason and to have them at the forefront of things again was rather refreshing. The big revelations at the end were quite interesting as well and it's a shame that we didn't get to see where those realizations would lead to in a continuing Legends story universe. But as the book did close the chapter for all of Legends, the ending wasn't the strongest in terms of the narrative but it was rather fulfilling on an almost emotional level. What Could Have Been Better: The antagonists in this book, the Qreph brothers, are not the greatest enemies in the world. They are Columi, who look like aliens straight out of Men in Black and are so smart that they are always several steps ahead of the good guys. How this so isn't explained all that well and the scenes where we follow their thoughts and interactions with one another don't show this either. Being smart isn't perfection in itself. Then the fights in the book whether in space or on the "ground" as it were weren't the best I've encountered in Star Wars books. And let's face it - with a book franchise like this being based on an action adventure movie series, you still look for that same experience in the books. And not quite getting it in any Star Wars novel can be a little disappointing regardless of what other aspects are the points of focus instead. And as this book featured action, it's not ridiculous to hope for these scenes to be suitably awesome. TL;DR: Star Wars: Crucible was an interesting end to the Star Wars Legends universe and is a nice adventure focused on the franchise's biggest heroes. It's not a perfect book but it's still an enjoyable one. And thus it gets 3.5 excuses for Lando to bring in his robots out of a possible 5.